It appears that whilst not quite dead in the water, Destination Kirkby is flat on it's back and getting the water pumped from it's lungs by, of all people, Gordon Brown. The Prime Minister's view on the matter is that the project needs to be resurrected as Liverpool needs to have a world class stadium - it being England's prime footballing city, and that's just a fact! - to help the 2018 World Cup bid. 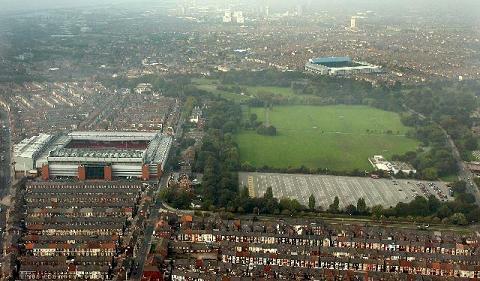 Obviously, he holds no faith in Liverpool's plans for Stanley Park and should Destination Kirkby be shelved indefinitely then there's no way the Blues will be in a new ground in time for the World Cup. So Brown hopes that a scaled down version of the plan, with the ground and the Tesco but none of the other retail developments, can be given the green light. Which, you would think, would be great news for Everton but as yet, there has been no official response to the Prime Minister's proposals and Bill Kenwright has said nothing more than the matter is now closed. It's unclear whether Kenwright is just doing his usual disappearing act when things go bad but it seems strange that he's not grasped this lifeline, which has come from the very top, particularly in light of the fact that whilst the enquiry was ongoing it appeared that the very future of Everton Football Club depended on Destination Kirkby being given the go-ahead! What's even more strange is the way that, as soon as the plans were shelved, the club seemed to adopt the stance that a ground share was now a more viable option. Robert Elstone has come out on more than one occasion to say that we should look at sharing a ground with them over the park. And now David Moyes has added his weight to the debate with a sort of half-committed statement. The Everton boss, after clearly being pressed on the matter - and probably not even wanting to think about Chelsea at the weekend - said: "I would be interested but I know there would be concerns." He added: For whatever reason we don’t do it in this country. But it may well work here in Liverpool. It could do. I think we would probably be interested because we don’t have a stadium." Which is hardly nailing his colours to the groundshare mast and it seems that he's just towing the line with the club's new outlook on the stadium issue. Which is worrying on the one hand as it could come across that our plans have gone belly up so we're going to them, cap in hand, and begging for them to reconsider. They will obviously play on this but they're in danger of shooting themselves in the foot with their steadfast refusal to even consider the plans. 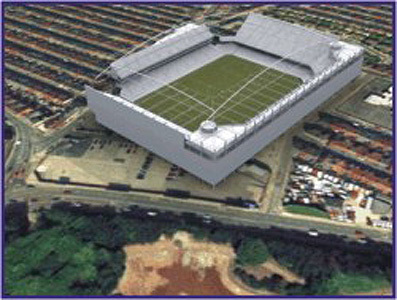 They still have this dream of a Stanley Park mega-stadium but anyone with any ounce of common sense, and a little cynicism, can see that this is simply never going to materialise! But the facts are that, financially, they're in a worse position than us with £350 million worth of loans due for repayment by Gillet and Hicks in January. And, given the state of the Dubai economy, there's not going to be a 'rescue package' coming in from the middle east any time soon. 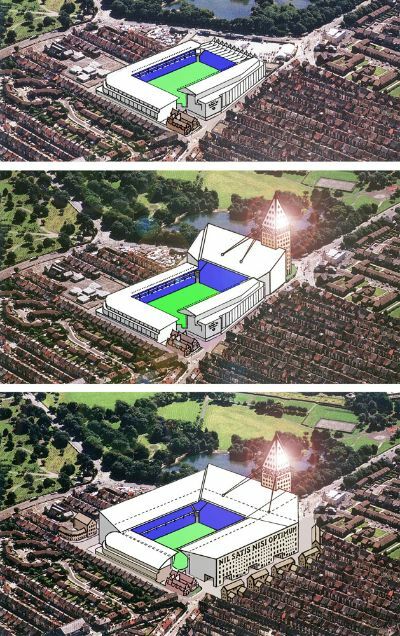 It's unlikely that Liverpool City Council will give them any more help and, with Everton adopting the ground share stance, it's increasingly likely that the council will also push for this option as, economically, it makes sense. Obviosuly nothing is straightforward where footballing rivalries are concerned and there are so many logistical hurdles to overcome that the project would be a massive headache. But given the state of the economic climate and the finances of both clubs it may well become the only viable option. The Prime Minister's view on the matter is that the project needs to be resurrected as, due to it being England's prime footballing city (that's just a fact!) 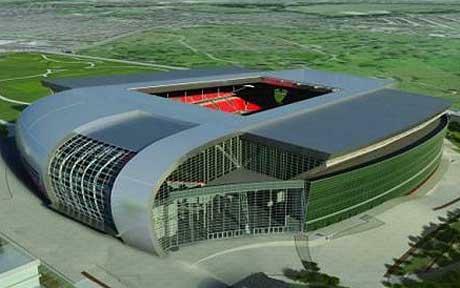 Liverpool needs to have a world class stadium to help the 2018 World Cup bid. He added: For whatever reason we don’t do it in this country. But it may well work here in Liverpool. 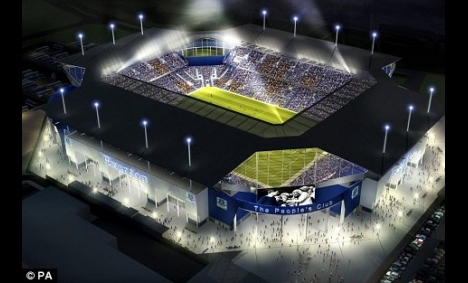 It could do.I think we would probably be interested because we don’t have a stadium." Though it would be interesting to see how much of a difference £100 million would make to the grand old lady....but really, what cranks come up with designs like these? !